Well technically winter hasn't officially arrived yet, but I'm considering the fall season done. I went back to the lower Ausable Friday. The weather wasn't horrible, but the fishing sucked. Had one fish on for the whole day. I didn't bring my boat so probably shot myself in the foot for that. One of my favorite spots I used to fish it alot, but now the bank has caved in with a big tree in the way, and one of the property owners adjacent ran a fence all the way down into the water so no way to get around from the bank. I just know theres fish in the hole but its a boat only fishery now. Got to say, this years fall runs were pretty dismal. I suppose for Salmon it would be considered fair. I sort of thought, maybe I'm mistaken, but didn't the state cut Salmon and kept the Steelhead plants intact? Seems like there was more Salmon than Steelhead the entire fall season. From the Spring runs, Skamanias, and mix of fall runs, I just didn't get into the steelhead like I usually do. I'm kinda holding out hope that the conditions just weren't ever perfect and theres a whole bunch of Steelhead to trickle up the rivers all winter. But winter fishing is getting tough on me. I can't take it like I used to. I have a lot of circulation issues with my hands and I literally have trouble just holding my rod when it get below freezing. My hand around my thumb and index finger go numb quickly. I get clumsy and drop things. Have trouble tying knots. It's frustrating. I used to love winter. Anyway hope everyone else did better than I did this fall. I'll be back out eventually. Maybe one more time before Christmas if I can find the time between work and family stuff, and the weather isn't completely atrocious. Good luck and Happy Holidays!!! Welcome Dan, can't help you with the WI reports. MI hasn't been exactly awesome. Could be worse. Gosh would have thought Oregon would be like heaven. Saw this on mlive but all they said was the man was from WI. Thats a trip. The lake has been weird this fall. The water level is high. It only takes a little wind to wash over the breakers. Fishing the south peir at St Joe I think I could beach fish without a net out towards the end of the peir. And the south pier at manistee on the lake side I used to stand and fish from the rocks. Now I get nervous standing on the lower edge of the concrete foote. The rocks are completely submerged, and the concrete foote is covered in slimmy slippery algae. Waves regularly wash over it and is difficult to climb back up to upper level due to the algae. Well that settles it. I'm cursed Going to hit some different water this weekend. Hopefully I can find some place that doesn't have 30 different guides running clients every single day of the week. So I've been fishing every friday since labor day weekend. Mostly up north on the BM. 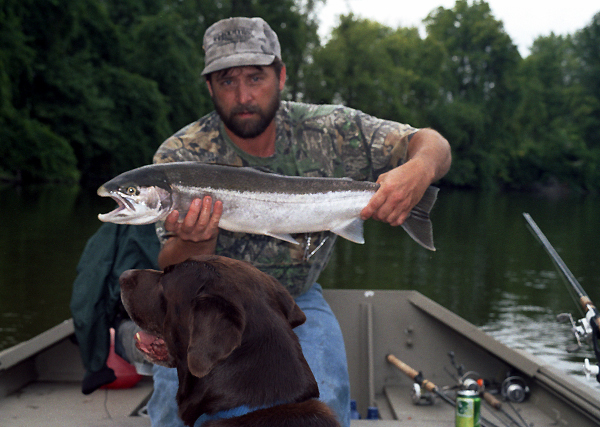 I can't buy a steelhead! Up till this past friday I was at least getting salmon. Not my target species to say the least but it was somethin. Last friday I couldn't even hook one of those. Now I know some guys are going to say its early, etc... but I been fishing many years now. I don't remember the last time I didn't already catch quite a few steelhead by the end of oct. Something weird going on this year. Either I'm cursed, (entirely possible), or there just aren't many steelhead this year. I'm fixen to go again this friday. Sooner or later I got to get into some. Nov is usually I good time for fishing. If fish aren't running good by the 15th I'm thinking something is not good with the steelies. Thought I would see if I could find any Steelhead in the Joe. But no Steel for me. Pretty much just fed the Channel Cats. They were actually a bit annoying. Did hook one King, but couldn't get the net on him. Had a couple other quick jerks but no solid hook ups. Like said though, probably 25 Channel Cats? I lost count. River is low. And in my opinion still too warm.But you never know. I took my wife here many years ago the it was last week in sept, water was low and mid 60s, she took her biggest Steelhead she's ever caught. I had it mounted, 17lbs! So you just have to go. You never know what will happen. Anyway heading north next friday. Steelheads got to show up soon! Glad you got some! The bird thing is funny. They are kinda tiny so they probably get tired out there. Yeah the nice weather is "nice" and all, but it aint helping the fishing. I see the DNR says that steelhead and a few salmon have been passing through the fish ladder at BS. Sounds like a decent trip. Cooler weather this past weekend has me getting the itch. Seems like its been a long hot summer! Fished the south pier at mansitee friday morning. The lake side was very cold water. The river side was surprisingly cool as well but not as cold as the lake. Fishing was so so. I hooked two very large fish myself but couldn't get them netted. Broke them off in the rocks. Friend got a really nice male. 25lbs! Boats seemed to be doing fare. Mostly getting fish from right off the end of the pier. Not gang busters but every so often they would hit fish. Wind picked up and I had to leave. Went down to Ludington and same story there. Waves coming over the piers. Did some exploring up in the river. Pere Marquette. Surprised to find a few fresh salmon in the river. But no biters. Headed down to the white river pier just to check it out. Waves were really big by this time. Guys surfing in wet suits. Water much warmer than up at Manistee. No fish seen. Pretty much no one fishing. Worked some lures but nothing hapenning. Did manage to get me some eggs from some nice boat anglers. Heading up for a trip here in a couple weeks. Looking forward to autumn! Good report! I have to stay close to home right now as my daughter is about to give birth to our 2nd grandbaby. She is due any day and I have to be ready to watch my grandson when she goes into labor. Hopefully the Cohos stay in close for a couple more weeks. And don't catch them all make sure to leave me at least a couple! Wow that totally slipped my mind. Thanks for the reminder.